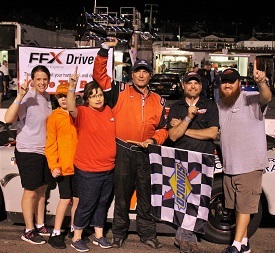 Jennerstown, Pennsylvania (September 16, 2018) – A bevy of winners, some expected and one completely unexpected going into the weekend, were celebrated during the third and final Super Cup Stock Car Series trip of the season to Jennerstown Speedway Complex. 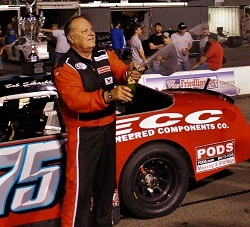 The American Racer Night at the Races presented by Performance Fiberglass Products started off where it left off three weeks ago. 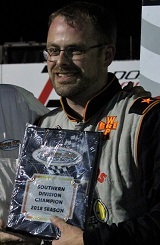 Brent Nelson captured his first Pole Award of 2018 with a best time of 20.22 seconds. After the redraw, the No. 80 Royal Purple / Airtek Inc. / Steam Turbine Services / Precision Auto Collision / Atkinson Welding Chevrolet accelerated into the lead from the outside front row ahead of fellow championship contender Mike Potter. The first Twin 50-lap feature went clean and green for a majority of the distance with Nelson leading through halfway; however, picking up positions and lurking behind him was Stephen Cox. The Indianapolis, Indiana driver in his first Jennerstown appearance of the year had to climb from the eighth starting position after spinning on his first qualifying lap earlier in the afternoon. Coming to 12 laps to go, Cox dove the No. 21 STA-BIL 360 Performance / Impact Race Products / CR7 Motorsports Chevrolet into the corner and Nelson’s car went up the track. His lead would not last long though. With five circuits remaining, Cox’s car suddenly snapped and spun out of the top spot in nearly the same part of turn two as in qualifying. Nelson then held off some fierce challenges but cruised to his third straight and eighth career SCSCS win. Cox could only recover to a ninth place finish and was left bewildered about what took him out of winning contention. 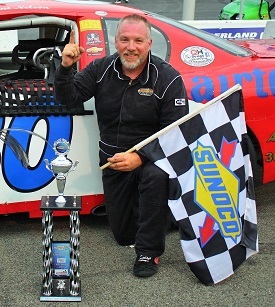 An early contender for the lead but a salvaged fourth place finish was good enough for Kevin Kromer to lock up the 2018 Northern Division title. The cancer survivor, who was left at the time of diagnosis not knowing whether he would step back in a race car, worked a vast majority of the 48 hours leading up to Saturday getting a newly prepared No. 77 Lehigh Valley Cancer Institute / Mission R.A.C.E.R. / Warren Pallet / K2 Motorsports Toyota ready and battled a transmission seal leak which caused the clutch to keep slipping during the course of the night. 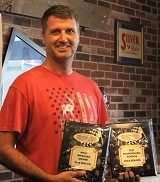 Toby Grynewicz and Larry Berg each achieved a top five result, but the biggest surprise was the driver who finished runner-up. 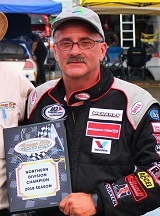 2016 SCSCS champion Harvey Harrison had been absent from competition throughout 2018 and was not pre-entered prior to the event. The trailer containing the No. 51 John 3:16 / Southern Coal Corporation / Harrison’s Motorsports Chevrolet was the final one to arrive, unannounced, a few minutes prior to opening practice. Harrison started outside Freeport, New York’s Ron Langdon on the front row for the second Twin 50. Langdon jumped to an advantage for the first 20 laps in his No. 17 National Appliance / Langdon’s Automotive Chevrolet. A yellow flag slowed the field on lap 20 when Samatha Rohrbaugh, in her second career series start, went around in turn three. Harrison used his preference to restart on the outside and cleared Langdon and then multiple challengers on ensuing restarts over the remainder of the distance. His toughest match came from a contender in the first race. Coming to the white flag, Cox got his best run on Harrison while navigating lapped traffic, but yet again turn two would be his kryptonite. “I ran Harvey clean for probably a good 10 laps,” the eventual eighth place finisher recapped. “Harvey runs us clean everywhere. I’m not going to bump him, I’m not going to mess with him, but I was faster than him on the low side in the center of the corner and he was faster than me coming off of two. A green-white-checkered finish set up one final duel between Harrison and Potter, who struggled with overheating issues in the first race and had to start the second one from deep in the field. The two veteran drivers were nearly even at the line when the white flag was displayed. 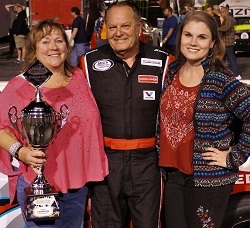 Nevertheless, it was the Renick, West Virginia driver, in his first outing of 2018,that was successful for his fifth career SCSCS victory. Harrison added his pleasure with the numerous door to door battles he was a part of throughout the night. Potter admittedly thought the white flag was actually the checkered and slightly backed off through turns one and two, but managed to still finish third. 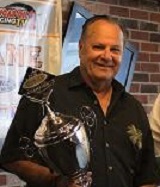 Langdon and Kromer rounded out the top five, but quietly creeping into second was four-time winner in 2018, Bob Schacht. By virtue of a sixth place result in the first Twin 50, the Mooresville, North Carolina racer was only required to take the green flag in the second race to win the overall SCSCS championship. 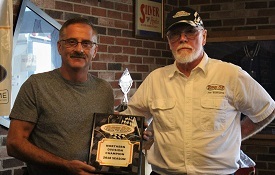 It was certainly a season of ups and downs even for the driver who earned his first title since the mid-1980s in the short-lived International Racing Association. Schacht additionally expressed gratitude for his crew members that played a big part in the effort to efficiently get the No. 75 Bob Schacht Motorsports Chevrolet back into working condition after suffering damage on multiple occasions. Despite a rough start to the season and potential motor issues in the second race of the night, Nelson wound up the bridesmaid in the final standings for the second time in his career and continued a streak of five straight years in the top three in points. 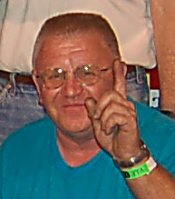 Potter, Kromer, and Bill Ashton rounded out the top five in the overall standings. Special awards handed out in Sunday morning’s trophy presentation included Top Performing Rookie and Most Improved (from beginning of the season to present) to Marc Jones, season-long Hard Charger (for his rally from the back to third most recently as well as obtaining the award in two other races) and Car Owner of the Year (for his series support, notably bringing five cars to the Kingsport Speedway event in June) to the aforementioned Potter, and Sportsman of the Year went to Harvey Harrison for the camaraderie he constantly displays even when having to be away from the track for much of 2018. 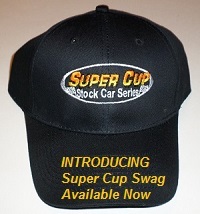 What is next for the 2018 Super Cup Stock Car Series champion? The focus remains on the immediate future. “We’ll go through Dominion and get that done and see what we’ll do next year,” Schacht answered. Dominion Raceway will host the final Southern Division event on Saturday, September 29. Schacht holds a slim five point advantage on Ben Ebeling. An additional special feature is being planned with details to be announced very soon. Each of the American Racer Night at the Races presented by Performance Fiberglass Products Twin 50s are scheduled to premiere on MAVTV in the near future. 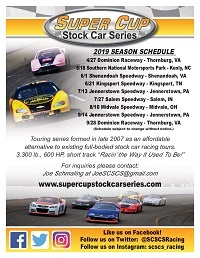 Stay tuned for an upcoming announcement regarding airdates, and please visit the official web site at www.supercupstockcarseries.com and the Super Cup Stock Car Series Facebook, Twitter, and Instagram for additional information.